OK mad is too strong of a word....frustrated sounds a little saner. I worked for hours on the layout I am about to show you......honestly.....HOURS!!!! I found this adorable sketch at Sketches In Thyme and missed the deadline by an hour. WAHHHHHHHHHHH!!!!!!!! I have followed their blog for some time now but FINALLY had the time to play along.......just didn't have the time to post my page......LOL. UGHHHHH.....such is life!! But I am gonna share it with ya'll anyway......just cuz this is MY blog and I can do what I wanna......even if that means eating chocolate before going to bed and running with scissors.....I like to live on the edge...bwahahahahahaha!!!! Just for giggles I am gonna share it with the girls over there too......just not in the challenge. Ok....as I was saying.........This was Challenge 19 over there and the sketch of the week was one from Scrapbooks ETC...........which BTW.......you GOTTA get the latest issue!!! As a rule I am not a huge fan of their magazine. Not sure why.......but the holiday issue ROCKS!!! 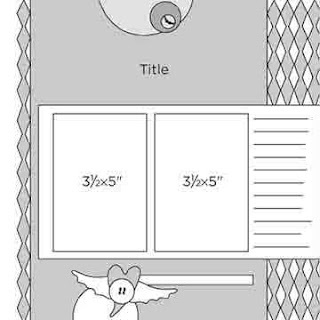 Soo many cute ideas and lots of adorable cards, Christmas decorations, and LOTS of liftable layouts!! Totally worth what I paid for it!!! I honestly tried to keep with the sketch.....but I took a wrong turn somewhere around Albuquerque and never quite found my way back home......lol. How adorable is that!!!!!! I went absolutely bracket crazy and used 5 of them.......lol. I hit Hobby Lobby AGAIN yesterday...which by the way is a totally evil place....they keep luring me back in and I keep spending money......don't tell Bob.....Shhhhhhhhhhhhhhhhhhhhhh!!!! I don't even remember what I originally went in for......lol. Ohhhh....ribbon!!! I always hit the clearance dept first.......and I found boxes of naked chipboard for $1.79!!!!! They are $10 boxes!!!! EEEEEKKKKKK!!! So I bought 3.......lol. So I inked the brackets up and glued the Jenni Bowlin paper to it and love how it turned out :) BTW.....I got an awesome deal on ribbon and tomorrow I will share a photo cuz you gotta see it to believe it!!! Found it in the ribbon area....NOT the scrap area!!!!! 2 huge ziploc bags crammed full of salvage pieces, trim for upolstery, clothing.....OMG KILLER stuff!!! $2 a bag!! 2 bags and I snagged em both!!!! I'm digressing again.........stupid mtn dew!!!! 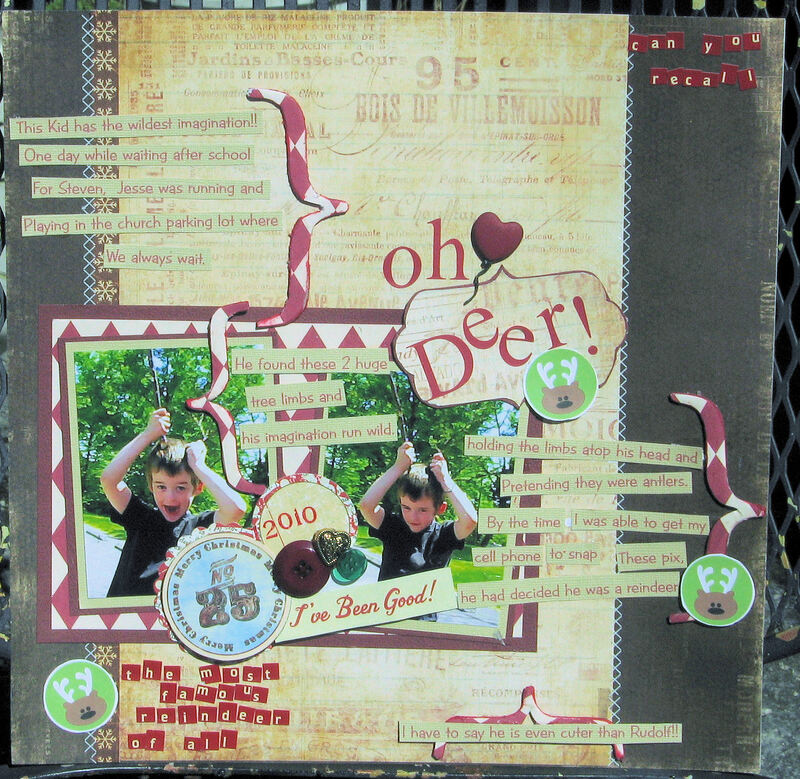 Ok....I used Pink Paislee Mistletoe & Co, Bazzill, Jenni Bowlin, Paper Studio, Cosmo Cricket and Crate Paper Joy Ride papers......Remarks and Cosmo Cricket Tiny Type letters and various buttons.This thing weighs a ton......LOL. Late or not.....this is AH-MAZING!!!!!!!!!!!!!!!!! You did a great job on it! Sorry you missed the deadline by an hour!! You rocked their sketch!! Seriously, one of your best layouts. Oh bummer! Fantastic layout though! Hi Tina, are you hitting the chocolate before bedtime, again!!! lol!! 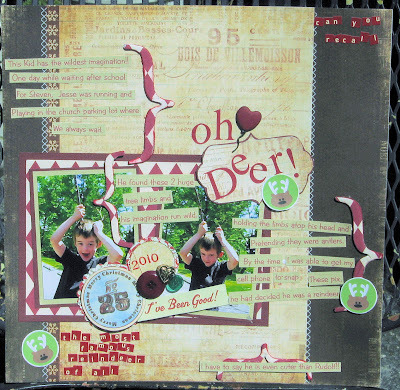 This layout is just too darn cute and the story is hilarious! I love the way you turned this into a Christmas page!!! So sorry to hear you missed the deadline(I've done that before), but sooo glad you shared it anyway, because it's to cute to have miss out on!!! Have a wonderful weekend!! Hugs!! !